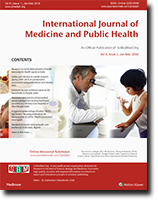 I. Santhanakrishnan, Kar, S. Sekhar, and S, G. Kumar, “Prevalence of tobacco use among adults in Ramanathapuram village of Pondicherry”, International Journal of Medicine and Public Health, vol. 4, no. 3, pp. 298-300, 2014.